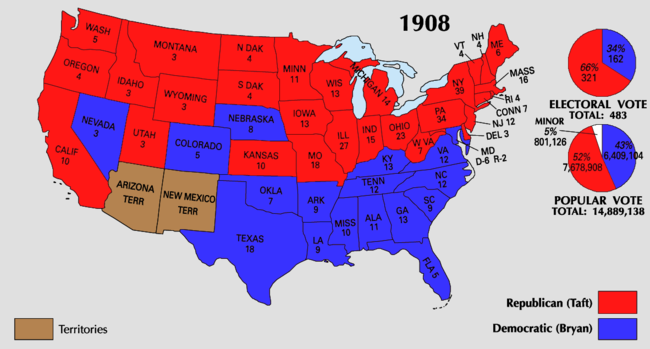 For related races, see 1908 United States elections. Presidential election results map. Red denotes those won by Taft/Sherman, blue denotes states won by Bryan/Kern. Numbers indicate the number of electoral votes allotted to each state. Popular incumbent President Theodore Roosevelt honored his promise not to seek a third term, and persuaded his close friend, Taft, to become his successor. 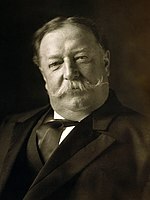 With Roosevelt's support, Taft won the presidential nomination of the 1908 Republican National Convention on the first ballot. 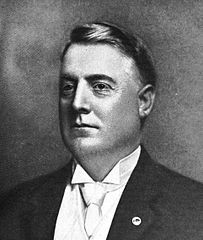 Having lost the 1904 election badly, the Democratic Party re-nominated Bryan, who had been defeated in 1896 and 1900 by Republican William McKinley. Despite his two previous defeats and the waning of the Free Silver issue, Bryan remained extremely popular among the more liberal and populist elements of the Democratic Party. Bryan ran a vigorous campaign against the nation's business elite, but the Democrat suffered the worst loss of his three presidential campaigns. Taft won 51.6% of the popular vote and carried most states outside of the Solid South. Taft's triumph gave Republicans their fourth straight presidential election victory. Two third party candidates, Eugene V. Debs of the Socialist Party and Eugene W. Chafin of the Prohibition Party, each took over 1% of the popular vote. The Republican nomination contest marked the introduction of the presidential preference primary. 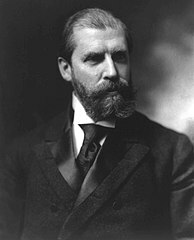 The idea of the primary to nominate candidates was sponsored by anti-machine politicians such as New York Governor Charles Evans Hughes and Senator Albert B. Cummins. The first state to hold a presidential primary to select delegates to a national convention was Florida in 1904, when Democratic Party voters held a primary among uninstructed candidates for delegate. Early in 1908, the only two Republican contenders running nationwide campaigns for the presidential nomination were Secretary of War William Howard Taft and Governor Joseph B. Foraker, both of Ohio. In the nomination contest, four states held primaries to select national convention delegates. In Ohio, the state Republican Party held a primary on February 11. Candidates pledged to Taft were printed on the ballot in a Taft column, and candidates pledged to Foraker were printed in a column under his name. Taft won a resounding victory in Ohio. 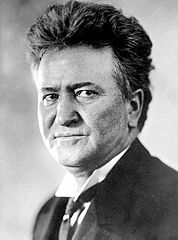 The three states holding primaries to select delegates without the preference component were split: California chose a slate of delegates that supported Taft; Wisconsin elected a slate that supported Wisconsin Senator Robert M. La Follette, Sr., and Pennsylvania elected a slate that supported its Senator Philander C. Knox. The 1908 Republican Convention was held in Chicago between June 16 and 19. William Howard Taft was nominated with 702 votes to 68 for Knox, 67 for Hughes, 58 for Cannon, 40 for Fairbanks, 25 for La Follette, 16 for Foraker, 3 for President Roosevelt, and one abstention. 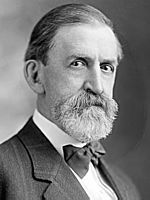 Representative James S. Sherman from New York received the vice-presidential nomination. 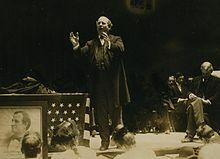 As the 1908 election approached, William Jennings Bryan was the front-runner for the Democratic presidential nomination. Bryan's most formidable challenger for the nomination was Minnesota Governor John Albert Johnson. Johnson's rags-to-riches story, honesty, reformist credentials, and ability to win in a heavily Republican state made him popular within the Democratic Party. In March, the Minnesota Democratic State Convention endorsed Johnson for president. By the end of June, however, Bryan had amassed more than the requisite two-thirds of the delegates needed for nomination. The 1908 Democratic National Convention was held in Denver between July 7 and 10. Johnson, aware of the fact that Bryan's nomination was a foregone conclusion, released his delegates, thereby allowing Bryan to win the nomination on the first ballot. Bryan left the choice of vice-president to the delegates. John W. Kern from Indiana was unanimously declared the candidate for vice-president without a formal ballot after the names of Charles A. Towne, Archibald McNeil, and Clark Howell were withdrawn from consideration. Kern was a former state senator (1893-1897) and two-time gubernatorial candidate (1900 and 1904). 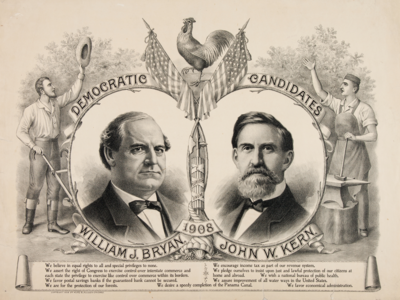 In response to nomination of Bryan and Kern, The New York Times disparagingly pointed out that the Democratic national ticket was consistent because "a man twice defeated for the Presidency was at the head of it, and a man twice defeated for governor of his state was at the tail of it." Disappointed with his performance in the 1904 Democratic presidential nomination campaign, and disillusioned as to his chances of successfully attaining it in 1908, William Randolph Hearst decided to run instead on the ticket of a third party of his own making. Originally borne from the Municipal Ownership League, a vehicle for Hearst's ultimately unsuccessful bid for the mayoralty of New York in 1905, it was Hearst's intention to fuse it with the remnants of the Populist Party led by Thomas Watson, a former Representative from Georgia who had been its presidential nominee in 1904. However, these intentions were dashed when every candidate that the Independence Party put forth in elections held in New York was elected except Hearst himself, despite an endorsement by the Democratic Party. Devastated, Hearst declared his intention never again to be a candidate. 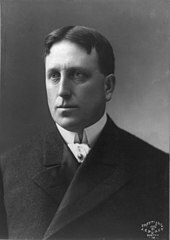 While Hearst would no longer be the nominee, he fully intended to exercise influence at Independence Party's convention; the platform itself was in large part a statement of his own views. With its candidates nominated, the party's purpose was changed from being a path for Hearst's presidential ambitions to being an instrument of his wrath. Through the influence of his papers and generous financial donations, Hearst hoped that the Independence ticket would draw away votes from William Jennings Bryan and lead to his defeat against Taft, a personal vendetta for Bryan failing to support his own bid for the Presidency in 1904. 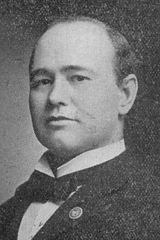 Eugene Debs had originally hoped that Bill Haywood, who had attained a national profile from being put on trial for the murder of Frank Steunenberg, of which he was acquitted, would run for the Socialist nomination for president. At this time however the Socialist Party was fracturing between its radical and more moderate elements, and Debs was deemed the only candidate capable of keeping the party unified. 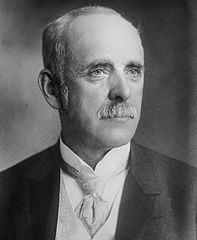 He was overwhelmingly nominated for the presidency on the first ballot, with Benjamin Hanford again named as his running-mate. The aging and balding "Boy Orator of the Platte" delivers a speech. With the Free Silver issue no longer dominant, Bryan campaigned on a progressive platform attacking "government by privilege." His campaign slogan, "Shall the People Rule? ", was featured on numerous posters and campaign memorabilia. However, Taft undercut Bryan's liberal support by accepting some of his reformist ideas, and Roosevelt's progressive policies blurred the distinctions between the parties. Republicans also used the slogan "Vote for Taft now, you can vote for Bryan anytime," a sarcastic reference to Bryan's two failed previous presidential campaigns. The Socialist candidate, Eugene Debs, embarked on an ambitious whistle-stop tour aboard a train nicknamed the Red Special, giving speeches regarding the Socialist cause across the country. The exertion of the tour exhausted Debs, and at certain points his brother Theodore - who bore a great resemblance to Eugene - substituted for him to allow the candidate to rest. Businessmen continued to support the Republican Party, and Bryan failed to secure the support of labor. As a result, Bryan ended up with the worst of his three defeats in the national popular vote. He lost almost all the northern states to Taft and the popular vote by 8 percentage points. 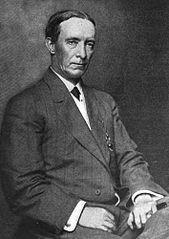 This would be Bryan's last campaign for the presidency, although he would remain a popular figure within the Democratic Party and in 1912 would play a key role in securing the presidential nomination for Woodrow Wilson. 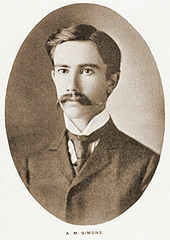 Charles W. Bryan, William's brother, would become the (losing) Democratic nominee for Vice President in 1924. Results by county explicitly indicating the percentage for the winning candidate. Shades of red are for Taft (Republican), shades of blue are for Bryan (Democratic), shades of green are for "Other(s)" (Non-Democratic/Non-Republican), grey indicates zero recorded votes, and white indicates territories not elevated to statehood. Roosevelt handing over his policies to his political protégé, William H. Taft. Forty-six states participated, as Oklahoma had joined the Union less than a year before. Bryan won forty-eight counties in the new state of Oklahoma. The most important increase in number of counties carried by Bryan was in the West South Central section, in part due to the vote of newly admitted Oklahoma. Of the 2,858 counties making returns, Taft won in 1,494 (52.27%) while Bryan carried 1,355 (47.41%). Nine (0.31%) counties recorded more votes cast for "Other(s)" than either of the two-party candidates, whilst twenty-eight counties (0.97%) recorded zero votes due to being inhabited either by Native Americans who would not gain full citizenship for sixteen years, or by disenfranchised southern African-Americans. Taft had a majority in 1,325 counties while Bryan had a majority in 1,204 counties. By carrying 1,355 counties, Bryan won more counties than he had in 1900 (1,340), but he did not reach or surpass the number of counties he had won in 1896 (1,559). While Bryan won more counties than McKinley in 1896, Bryan failed to carry more counties than the Republican candidate in 1900 or 1904. Compared with his strength in previous elections, however, Bryan carried 69 counties in 1908 which had not been Democratic in either 1896 or 1900. Bryan increased the area carried by Democrats in every part of the country except New England and the South. He doubled the number of Democratic counties in Wisconsin and won more counties in Indiana than were carried by plurality vote by the Democrats in any election in the Fourth Party System except 1912. He made decided gains in Missouri and in his home state of Nebraska, besides achieving notable victories in Colorado and Nevada. However, in four Western states (Washington, Oregon, Wyoming, and North Dakota), there was not one Democratic county. This was true likewise of Michigan, Delaware, and each of the New England states. The total vote increased greatly, by more than a million vis-à-vis 1904. Each party shared in the increase, but whereas Taft had nearly fifty thousand more than Theodore Roosevelt, Bryan had nearly 1,500,000 more votes than Alton Parker had garnered, and more than in either of his previous campaigns. It was noticeable that the "other" vote was only about seven thousand less than four years earlier. The "other" vote was a plurality in nine counties in the states of Georgia and Texas. The size of the vote cast for the defeated Bryan in 1908 is clear evidence of perhaps the most striking feature of the American presidential vote. In this third attempt at the presidency, and in an election following one in which the nominee of his party polled only five million votes, Bryan had heavy support in every section of the country, and in every state. Moreover, nearly two-thirds of the vote cast for Bryan was from the fifteen states of the (Northeastern) Mid-Atlantic, East North Central, and West North Central sections, in which the Democratic candidate carried only one state (Nebraska). Despite all conclusions as to predominant sentiment in the different sections and its economic, social, and political causes, there was a national vote cast for Bryan, and it was urban as well as rural; it was eastern, western, southern, and northern. Everywhere the Democratic Party was the minority party, and it was not hopeless, nor was it helpless. It was the agency for the expression of the opposition of almost six and a half million voters. This was the last election in which the Republicans won California, Idaho, Kansas, Missouri, Montana, New Hampshire, North Dakota, Ohio and Wyoming until 1920. As of 2017, this is the last of only two elections when Kansas and Nebraska have not voted for the same candidate. [a] The election of 1908 was the last election in which a Republican won the presidency without winning Nebraska. It is also the last election in which a Republican won without Nevada and/or Colorado until 2016. Source (Popular Vote): Leip, David. 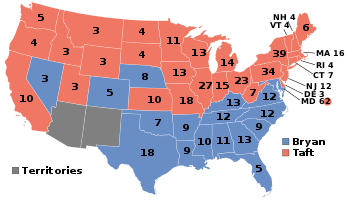 "1908 Presidential Election Results". Dave Leip's Atlas of U.S. Presidential Elections. Retrieved September 10, 2012. ^ Bain, Richard C.; Parris, Judith H. Convention Decisions and Voting Records. p. 174. ISBN 0-8157-0768-1. ^ "Official report of the proceedings of the fourteenth Republican National Convention, held in Chicago, Illinois, June 16, 17, 18 and 19, 1908". Archive.org. Retrieved August 18, 2016. ^ a b "HarpWeek | Elections | The Democratic Nomination". Elections.harpweek.com. Retrieved September 23, 2017. ^ "HISGEN AND GRAVES NEW PARTY TICKET – The Independence Convention Makes Its Choice in Early Morning. BRYAN'S NAME WAS HISSED Small Riot Followed Attempts to Nominate Him and His Sponsor Was Threatened by Delegates. HISGEN AND GRAVES NEW PARTY TICKET" (PDF). The New York Times. July 29, 1908. Retrieved August 18, 2016. ^ Morgan, H. Wayne (1958). ""Red Special": Eugene V. Debs and the Campaign of 1908". Indiana Magazine of History. 54 (3): 211–236. Retrieved March 24, 2017. ^ The Presidential Vote, 1896–1932 – Google Books. Stanford University Press. 1934. Retrieved August 12, 2014. ^ "1908 Presidential General Election Data – National". Uselectionatlas.org. Retrieved April 26, 2013. Daniels, Josephus (July – December 1908). "Mr. Bryan's Third Campaign". Review of Reviews. Review of Reviews. 38: 423–31. Korzi, Michael J., "William Howard Taft, the 1908 Election, and the Future of the American Presidency," Congress and the Presidency, 43 (May–August 2016), 227–54. Wikimedia Commons has media related to United States presidential election, 1908.